Jimmy Tygh was born on this day in 1917. 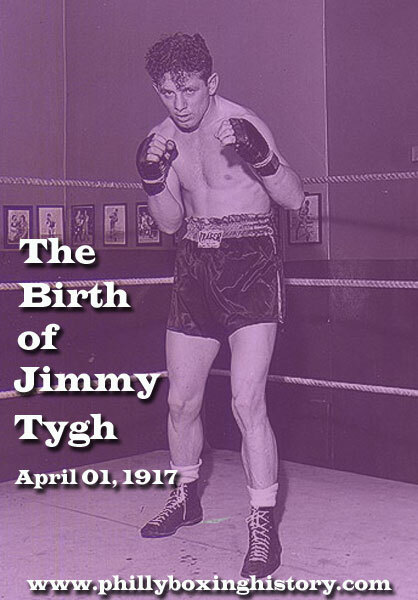 Tygh capped a successful amateur career by winning the Mid-Atlantic AAU featherweight champion-ship in 1937. He turned pro later that year with a 5th round KO of Bobby Montanez. Early in his ring days he beat Gene Gollotto, Jackie Sheppard, Bobby Green, Billy Passan, and Norment Quarles. Tygh went 29-0-1 with 9 KOs in his first thirty bouts. His first loss came at the hands of Billy Maher by eight-round decision in 1938. Jimmy reversed the loss in their second meeting one month later with a ten-round nod. In May of 1939, Tygh decisioned the great Tony Canzoneri during the final days of the all-timer's ring career. Other big name opponents included Leo Rodak (L10 & W10), Eddie Cool (KO4), Benny Bass (D10 & W10), Sammy Angott (KO by 3) and Sugar Ray Robinson (KO by 8). In all Tygh posted a career record of 52-19-5 with 12 KOs.